At Emergent, one of our focus areas is to invest in global tech companies out of India. In the past, I have also invested in Israeli startups and helped them target the US market. There is much to learn from the US-Israel corridor on how to foster collaboration towards building global tech companies. With this motivation, we organized the inaugural India Cloud Summit in Bengaluru in July. Cloud represents to two important values. First, it is levelling the playing field in many ways. Cloud has enabled people across the world to participate in the global economic process like never before. It is now possible to build a global product or service from your home geography. This, in turn, fosters a greater availability of economic opportunity across the world. Second, it encourages a consumption behaviour of ‘use only what you need’. Mahatma Gandhi said there is enough in this world for everyone’s need but not enough for one man’s greed. Our current consumption models have pushed the planet towards environmental damage. The growth of cloud technologies promotes significant efficiencies and a more sustainable consumption model. Hence, innovators in the cloud space need not think of themselves as merely driving improved IT, but rather as being enablers towards human wellbeing which is what every business needs to be about. This is why we chose to focus on Cloud as our theme for the summit. This summit was organized in collaboration with Botmetric, a cloud technology startup from Bengaluru. I was the first investor in Botmetric, and have seen its path to building a successful cloud technology product with customers in over 25 countries. Huge thanks to them because they led the execution to make this summit successful. When we were planning the summit, we did not know how much interest we would get. Our venue could accommodate 250 people. However, it was heartening to see overwhelming interest with over 700 registrations consisting of entrepreneurs, enterprises, VCs and media. Unfortunately, due to space constraints, we were not able to accommodate everyone but we hope to publish the videos from the event soon. We had a rich array of speakers and perspectives at the summit. I was fascinated to learn how Team Indus has built its moon rover project for 1/10th the resources that it would have traditionally taken. leveraging cloud-based technologies. They were kind enough to bring their rover to the conference and we all had a chance to have a close look at that. One of the highlights of the summit was the fireside chat between Jyoti Bansal (founder of AppDynamics, acquired by Cisco for $3.7B earlier this year) and Lakshmi Pratury (founder of INK conference). I have known Jyoti since 1995 when he was my classmate at IIT Delhi and his story as an entrepreneur truly stands out, and Lakshmi brought it to life with great questions. Gaurav Gupta and Neeraj Goyal presented how and why they built one of the world’s largest OpenStack deployments at Snapdeal. A key learning was how enterprises can have a large scale cloud while keeping costs under control. Sharad Sharma from iSpirit presented about the explosive growth enabled by India Stack in services such as UPI. It was fascinating to learn about the grassroots impact that it is driving across India. We had a number of informative panels with speakers from startups such as Nutanix, Rubrik, Botmetric, Cliqr (acquired by Cisco), Qubole and HashedIn to India’s leading users of cloud such as BigBasket, Shaadi and Aditya Birla Online. 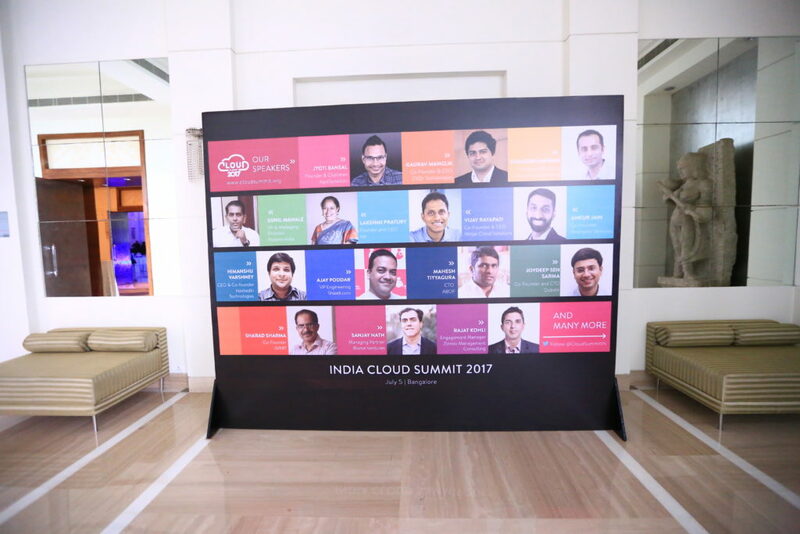 A key takeaway for me from the summit is that there is an emerging community of cloud innovators in India but they are underserved from lack of an appropriate forum to bring them together and foster collaboration. We aim to fill this need by making India Cloud Summit an annual event and help nurture a community of global cloud innovators.